The Psychotronic Zone: Tag! You're IT! It! One of the bestest monsters to come out of monsterdom. Even by todays standards, the creature has a stark-raving mad monster look to it. The kind of look that says...."RUN!" So imagine being stuck on a spaceship with IT? YIKES! We present It to you in all its Black and White glory....It! 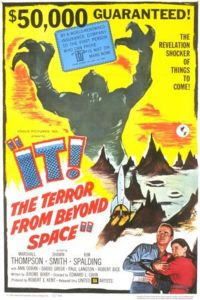 The Terror from Beyond Space.